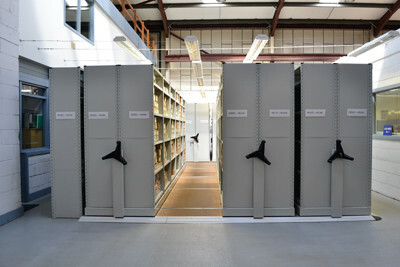 Archive shelving system’s are an important part of any business, library or public sector department. Archive shelving system’s come in a wide range of sizes from small bays for small businesses to archive their old documents, right through to full systems in warehouses for companies that store archive documents for other businesses. Archive shelving is relatively simple and with low pick rates most buyers simply want to maximise the density of items stored. Most opt for standard cardboard archive storage boxes stored on archive shelves, but more complex and even motorised mobile storage systems are available. These are popular with medical records, libraries and museums that may have to store records that although they are rarely accessed, may need to be accessed quickly. Here at 2h Storage Solutions we have a wide range of storage shelves and archive storage from less than £100. We also have the ability to design bespoke one off mobile archive shelving system which can store hundreds of thousands of documents. Mobile archive shelving systems provide the ideal high-density, storage solution that maximises floor space and storage efficiency. Contact us on 01937 585 057 if its mobile archive shelving you require.